I saw the words “gender fluid assassin” and was sold. I immediately requested an ARC, even though I already had a number of other books to read. Then I saw the back blurb comparing it to Throne of Glass, and I started getting nervous. I hated Throne of Glass. Turns out, I shouldn’t have been worried. 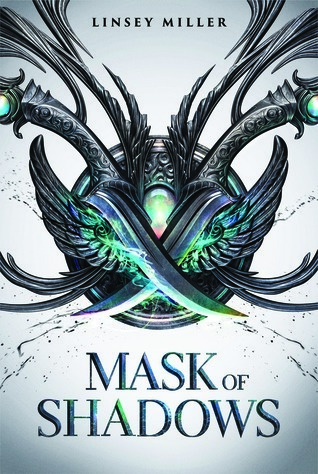 Mask of Shadows is way better, and it delivers practically everything I want from a YA fantasy book about a battle of assassins. Sallot Leon makes a living as a thief, but Sal doesn’t plan on staying a thief forever. They are still haunted by memories of their family and homeland… and the twisted Shadows that destroyed them both. Sal planned on joining the army to try and gain their vengeance, but then they find a flyer announcing that the Queen is holding trials for her new Opal, one of her four most trusted assassins. And Sal spies an opportunity. But it’s not until they’ve already joined the competition that they realize this is a fight to the death. Let’s get this out of the way upfront: Mask of Shadows is a story about a gender fluid person and not a story about being gender fluid. I’ve seen other reviews complaining that Mask of Shadows didn’t teach them anything about gender fluidity. Look, if you want to learn more about the subject, go read a gender fluid author writing about their experiences. As far as I’m aware, Mask of Shadows isn’t own voices, so it’s not were you should be going for an education anyway. It’s simply a fun, fantasy adventure novel where the protagonist happens to be gender fluid. You know, just like some protagonists happen to be cis men or cis women. Cis people shouldn’t have the monopoly on fun adventure stories! I don’t want to discuss this aspect too much more, since I’m cis and can’t talk about the accuracy of Sal’s portrayal. As far as I know, I didn’t see anything harmful. But then again, I could be completely missing something. Unfortunately, I haven’t yet found any reviews by trans authors at all, much less by gender fluid reviewers. If you know of such a review, please send me a link! I liked Sal as a protagonist. They’re (Sal uses she, he and they) smart, quick and nimble. All great traits for a rouge type character! Sal may not be the strongest or most well trained competitor, but they are able to use their cleverness to their advantage. Plus, Sal has a ruthless streak. They’re a tad more anti-heroic than I see in most YA protagonists. This makes total sense. Sal is competing to be an assassin, so ruthlessness is key. When I said Sal was haunted by memories of war and twisted magical creatures, I meant it. It’s to the level where I’m wondering if Sal might have PTSD? In reflection, a couple of scenes read that way. I’m no psychologist, so don’t put too much faith in my speculations. The entire cast of Mask of Shadows was fairly diverse. Sal is described as having dark brown skin, and their love interest is a bisexual girl! There’s also an aromantic supporting character and lots of other characters of color, including the Queen. The culture felt gender egalitarian, and female characters occupied a number of different roles, including ones that other fantasy books typically reserve for men. And guess what? There were multiple significant and sympathetic female characters, none of whom is ever implied to be superior to other women. While I infer that Sal’s culture is gender egalitarian, it was hard to get much of a feel for it otherwise. World building in general is scanty, which is too bad. It’s one of my favorite parts of the fantasy genre. Besides the gender egalitarian aspect, it basically seemed like every other faux-medieval fantasy I’d read. Mask of Shadows is a debut novel, and I can sort of tell. It’s not bad! In fact, I’d say it’s really good for a debut! But I did come away with the sense that it could be stronger. World building is probably the weakest point. Everything else is as good as it needs to be… it’s just not as good as it could be? I hope that makes sense. So while I do think it could be improved, I still enjoyed it a lot. And I am definitely reading the sequel and whatever else Linsey Miller writes. I received an ARC from the publisher via Netgalley in exchange for a free and honest review. I quite liked the world-building but I found that, while it didn’t info dump, it didn’t tell me enough about the world for me to get a good picture. I liked the sound of the history and everything, I just didn’t get enough of it. I agree, I would have liked to get a clearer sense of the world.